environmental marketing claims. These Guides are the go-to standards for green marketing claims and have counterparts in Canada, UK and Australia. The FTC Green Guides have been updated from time to time as the green marketing landscape has evolved. This latest update, issued on October 1, 2012, addresses new terms such as ‘carbon offsets’ and ‘renewable materials’. It spotlights the use of eco-seals and certifications. 5 additional strategies for underscoring credibility — including a discussion as to why cause marketing may be dead. 7 charts and graphs of hot-off-the-press data on consumer attitudes towards green claims, eco-labels, etc., (also provided as a free PowerPoint). Ad Age has generously extended a 10% discount to our friends, so I hope you’ll take advantage of it. Jacquie Ottman is an expert advisor on green marketing and eco-innovation to corporate sustainability leaders and US government eco-labeling programs. She is the founder and principal of New York City-based,J. Ottman Consulting. She is the author of the highly acclaimed, The New Rules of Green Marketing: Strategies, Tools and Inspiration for Sustainable Branding (Berrett-Koehler, 2011). It was named by Cambridge University (UK) as a top 40 sustainability book. 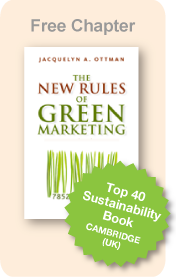 Subscribe to Jacquie Ottman’s Green Marketing Blog by clicking here.